This was the last card I tucked into my Operation Write Home box this morning before shipping it off. 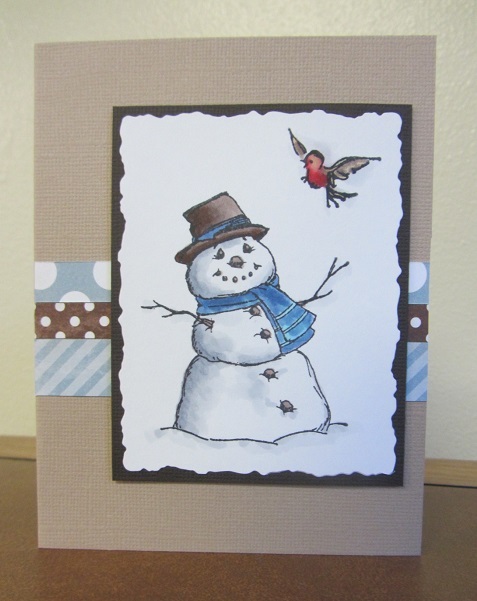 Winter cards (not Christmas) are in demand, so I crafted this snowman card. The stamps are from an Art Impressions set, and I colored the images with Copic markers. I used the current sketch at Clean and Simple Stamping: Sketch #264 for design inspiration. Thanks for stopping by. This entry was posted on Tuesday, October 29th, 2013 at 10:52 pm	and tagged with Art Impressions, cardmaking, copics, echo park, stamping and posted in Clean & Simple, General Cards, OWH, Uncategorized, Winter. You can follow any responses to this entry through the RSS 2.0 feed. Great coloring, sweet image, like the papers to go with them!